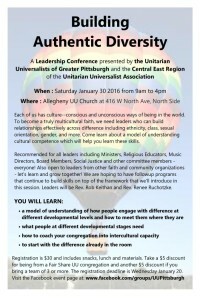 A Building Authentic Diversity Leadership Conference will be presented by the UUs of Greater Pittsburgh and the Central East Region of the Unitarian Universalist Association on Saturday, January 30, 2016 at Allegheny Unitarian Universalist Church. Each of us has culture–conscious and unconscious ways of being in the world. To become a truly multicultural faith, or build strong multicultural communities, we need leaders who can build relationships effectively across difference including ethnicity, class, sexual orientation, gender, and more. 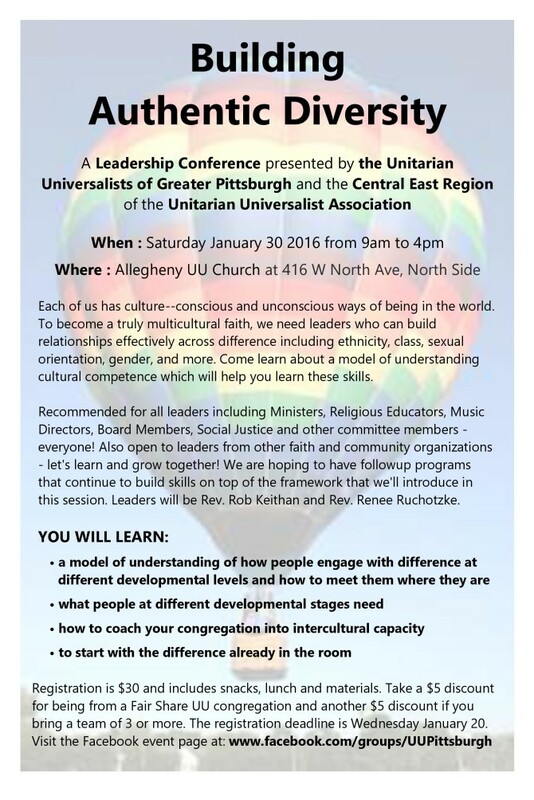 Come learn about a model of understanding cultural competence which will help you learn these skills. Recommended for all UU leaders and also open to leaders from other faith and community organizations – let’s learn and grow together! The facilitators will be Rev. Rob Keithan and Rev. Renee Ruchotzke. Begins at 9am and we’ll wrap up by 4pm. You can take a $5 discount for being from a Fair Share UU congregation and another $5 discount if you bring a team of 3 or more. The registration deadline is Tuesday January 26. Register here: http://bit.ly/1QjSsD6.